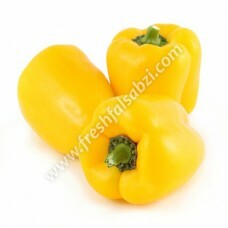 Yellow capsicums are an excellent source of vitamins C, B and A, dietary fiber and very low in calories. Also, minerals such as iron, magnesium, potassium and calcium are present. They contain low sodium and are cholesterol-free. It helps enhance the immune system and hence aid in preventing diabetes, arthritis and heart disease. Also, they prevent the risk of certain types of cancer such as colon cancer, reoccurrence of cold, and they aid gum and teeth health.